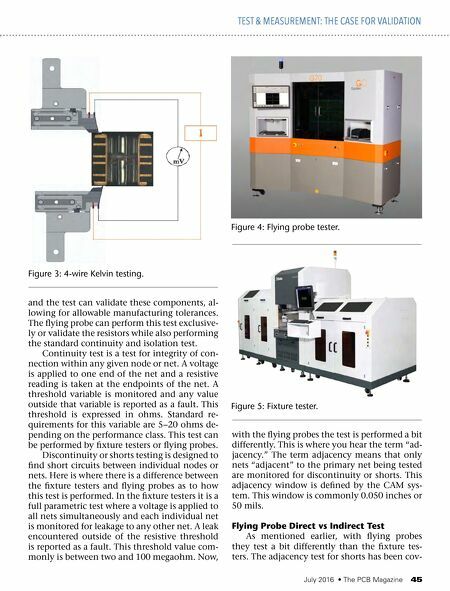 July 2016 • The PCB Magazine 45 and the test can validate these components, al- lowing for allowable manufacturing tolerances. 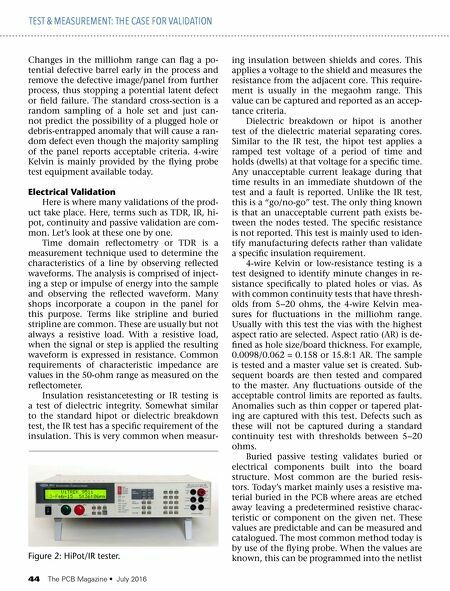 The flying probe can perform this test exclusive- ly or validate the resistors while also performing the standard continuity and isolation test. Continuity test is a test for integrity of con- nection within any given node or net. A voltage is applied to one end of the net and a resistive reading is taken at the endpoints of the net. A threshold variable is monitored and any value outside that variable is reported as a fault. This threshold is expressed in ohms. Standard re- quirements for this variable are 5−20 ohms de- pending on the performance class. This test can be performed by fixture testers or flying probes. Discontinuity or shorts testing is designed to find short circuits between individual nodes or nets. Here is where there is a difference between the fixture testers and flying probes as to how this test is performed. In the fixture testers it is a full parametric test where a voltage is applied to all nets simultaneously and each individual net is monitored for leakage to any other net. A leak encountered outside of the resistive threshold is reported as a fault. This threshold value com- monly is between two and 100 megaohm. Now, with the flying probes the test is performed a bit differently. This is where you hear the term "ad- jacency." The term adjacency means that only nets "adjacent" to the primary net being tested are monitored for discontinuity or shorts. This adjacency window is defined by the CAM sys- tem. This window is commonly 0.050 inches or 50 mils. Flying Probe Direct vs Indirect Test As mentioned earlier, with flying probes they test a bit differently than the fixture tes- ters. The adjacency test for shorts has been cov- TEST & MEASUREMENT: THE CASE FOR VALIDATION Figure 3: 4-wire Kelvin testing. Figure 4: Flying probe tester. Figure 5: Fixture tester.